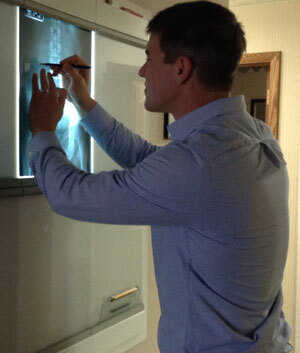 At Redenius Chiropractic, Dr. Redenius will use manipulation with our patients to correct misalignments in the body. If left untreated, these misalignments can cause patients a wide range of unpleasant symptoms such as headaches, stiffness, decreased range of motion, low back pain, numbness, and much more. Though most adjustments in a chiropractic office are of the spine, Redenius Chiropractic also provides extremity adjustments. 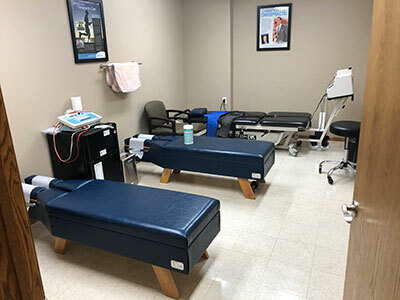 Because Dr. Redenius took a substantial amount of additional training beyond the required course work at Palmer College, he is well qualified to adjust both upper and lower extremities ranging from patients feet to shoulders. This modality is used widely within the practice to reduce muscle spasms to allow for adjustments to hold for a longer period of time. Many times when a patient comes in with a muscle spasm, Dr. Redenius can get the muscles to relax significantly by stimulating the muscle painlessly and effectively. Cold Laser is a hand held modality used in the clinic to increase healing speeds of injuries by further increasing the efficiency of the mitochondria within the cells of the body. By doing so, healing speeds increase greatly to allow for the patient to return to normal daily activities. Decompression tables are used frequently in the clinic for patients with a wide range of back and neck problems. With spinal decompression, the patient is comfortably placed on the table to allow the area of complaint to stretch apart and allow nutrients and hydration in. Spinal decompression is further detailed on the Spinal Decompression tab. With the partnership with Meridian Valley Lab, Redenius Chiropractic offers allergy testing. With a simple blood test, Dr. Redenius is able to find foods that cause an increased immune action that causes the allergic reaction symptoms. Redenius Chiropractic offers X-Rays to patients who need them. Redenius Chiropractic uses x-rays for a few reasons. As a primary care provider, Redenius Chiropractic is responsible for your health and wellbeing. Dr. Redenius must be exhaustive in his initial examination to find out as much as he can, at a fraction of the cost of surrounding radiology providers. -Diagnosis of possible pathologies or fractures that are noticed on plain film x-ray. -Spinography: Using your x-rays to further analyze your posture and possible misalignments (subluxations) to better serve you the patient. The curriculum at Palmer College requires Chiropractic students to take a variety of courses in Biochemistry and Clinical Nutrition. These courses have equipped Dr. Redenius with the necessary knowledge to counsel patients with nutritional advice tailored to each patient's needs. Redenius Chiropractic provides custom as well as standard orthotics for patients who may benefit from these inserts. Orthotics can help with many different conditions but are commonly used to equal length in congenital short legs and reduce low back pain. Kinesiology Tape has been proven with many research studies to increase pain free motion and reduce inflammation and swelling. However, Kinesiology Tape must be applied correctly to have the best results. As a Rock Tape certified professional, Dr. Redenius uses this tape on a routine basis. As a Chiropractic Physician, Dr. Redenius is highly qualified to perform pre-participation sports physicals as well as D.O.T. physicals for commercial truck and semi drivers in the area to provide the needed service at a reasonable price. 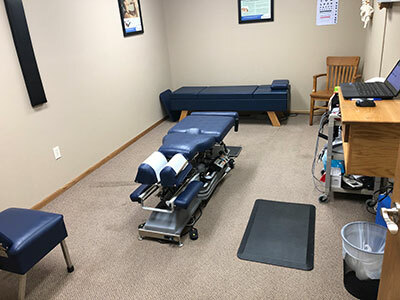 Redenius Chiropractic provides two types concussion tests for student athletes who get their pre-participation sports physicals with our clinic. These two concussion tests are Impact Software as well as the King-Devick concussion testing. A combination of these two concussion tests as well as along with a comprehensive neurological and orthopedic examination will allow for Dr. Redenius to provide the best care for all student athletes that is second to none.